Multiple recent reports have suggested that Sacramento Kings head coach George Karl has pushed for a trade that would ship out All-Star center DeMarcus Cousins, creating a considerable amount of chaos in California's capital just days before the Kings were set to make the sixth overall pick in the 2015 NBA draft. Some of those reports indicated that Karl might have interest in reuniting with Ty Lawson, his point guard during his latter years with the Denver Nuggets, reviving rumors that floated around prior to the February trade deadline, after Karl's midseason hire. After the Kings selected Kentucky defensive ace Willie Cauley-Stein at No. 6 on Thursday, the Nuggets were on the clock. Lawson, live-streaming the experience of watching the draft from his couch while smoking a hookah with some friends, offered an observation about what Sacramento drafting a Kentucky big man might mean for the Kentucky big man they already employ — "Cauley-Stein getting drafted might mean Cousins is gone" — before making a prediction about what was to come. "Backcourt. We need a two [shooting guard]," he says near the 2:30 mark of the video, before asking a question of one of his friends. "I mean, they should get Justise Winslow. They'll probably get [Emmanuel] Mudiay. Then I'm gonna get a bunch of tweets about, 'Oh, Ty, you getting traded.' For sure." And then, the Nuggets pulled the trigger, drafting 19-year-old point guard Emmanuel Mudiay — a highly touted prep prospect who committed to play for Larry Brown at SMU before instead bypassing the NCAA and heading to China to play professionally for a year — with the No. 7 overall pick. "I told you," Lawson says, "I'm going to Sacramento, bro." The remarks sounded less like a firm prediction as to what the future holds for Lawson — who averaged 15.2 points and 9.6 assists in 35.5 minutes per game last season, posting career lows in field-goal, 3-point and free-throw percentage for a 30-52 Nuggets squad that underperformed under head coach Brian Shaw, who was fired in March — than the idle and somewhat bemused joking of a guy with two years and $25.6 million remaining on his contract who doesn't seem totally sure what comes next. From the sound of his post-selection news conference at Barclays Center in Brooklyn, N.Y., on Thursday, Mudiay's looking forward to getting to link up with Lawson when he gets to Denver. "I know Kenneth Faried and Ty Lawson," Mudiay replied when asked what he knows about the Nuggets' roster. "That's the two main people that all of us know. Those are the two guys that really stand out on the team. 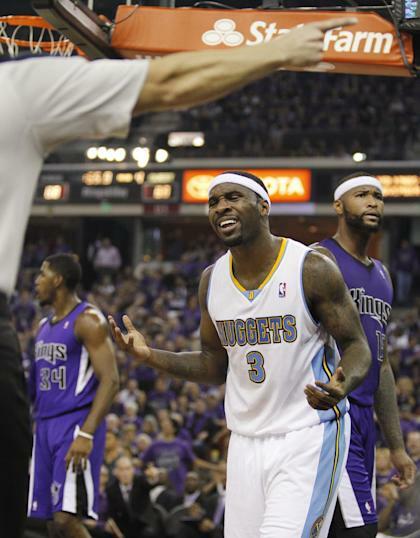 I can just learn as much as I can from Ty Lawson. He's been there a while, so I'm just going to try to get as much advice as I can."